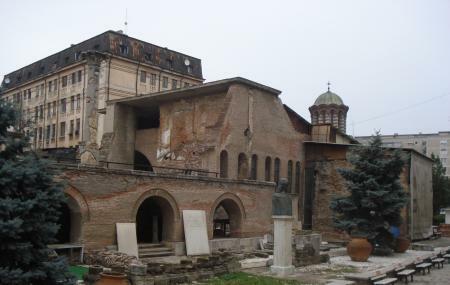 The old princely court isn't nearly as impressive to look at as the nearby Curtea Veche Church. But as far as sheer mystique goes, it's much more interesting. You see, the palace was built in 1459 on the orders of Vlad the Impaler, who is known in popular culture as Dracula. At the time, the palace was the economic centre of the city. Today, after the fire and earthquake in the 18th century, only ruins remain. Excavations in 1953 unearthed these ruins, an area of 25,000 square metres. Still visible on site today are the water supply system, the Turkish bath palace, exterior architectural flourishes, and some of the interior murals. 5 lei/person fee guide for groups more than ten people. By Metro M1, M2 stop Piata Victoriei. By Trams 22, 42, 45, 46 stop Piata Victoriei. By Buses 300, 381 and 783 stop Piata Victoriei. How popular is Curtea Veche? People normally club together Kretzulescu Church and National Museum Of Contemporary Art while planning their visit to Curtea Veche. People also prefer to start their day with Curtea Veche.